Yes, that is an Oreo in the middle of that chocolate chip cookie. Well, okay it is The Mart's chocolate stuffed knock off of an Oreo...but does that really matter in this instance. No I think not. For it is shoved in the middle of a whole lot of chocolate chip cookie. YUM. I got this recipe from Picky Palate. I used to frequent her site a lot. I don't think I have been there in forever. I saw a picture of these while reading another blog, and lets face it how could it NOT call out to me! It didn't help that I had a ton of chocolate not-quite-Oreos left over from our Retro Bowling party. So luckily for my Little Men, these cookies got made yesterday. They were ah-stounded that a cookie could be within another cookie. You kids will seriously love them...so go ahead, buy some milk, jog in place, then make some cookies. Preheat oven to 350. Cream butter with sugars. Add eggs and vanilla. Combine dry ingredients in a separate bowl and then slowly incorporate. Add chips. Using a cookie scoop, scoop two balls for each Oreo. Sandwich the Oreo in between the two balls (top and bottom). Lightly press the cookie dough together around Oreo. Press the cookie dough "seams" closed around the cookie. It will make one GIANT ball of cookie. Repeat until you have desired amount of cookies. I only made 12, because we don't need that much cookie around here. I refrigerated the rest of the cookie dough for another use. Bake the cookies for about 10 minutes. Mine were slightly golden and none-squishy to the touch (totally a technical cooking term). Let cool for about 5 minutes before transferring them to a cooling rack...or your mouth. Here is where you pour yourself a big glass of milk. I am not even going to say "hope you enjoy", I think it is pretty obvious you will. These look soooo yummy!!! I will be making these with my kids soon! You are seriously sooooo mean. 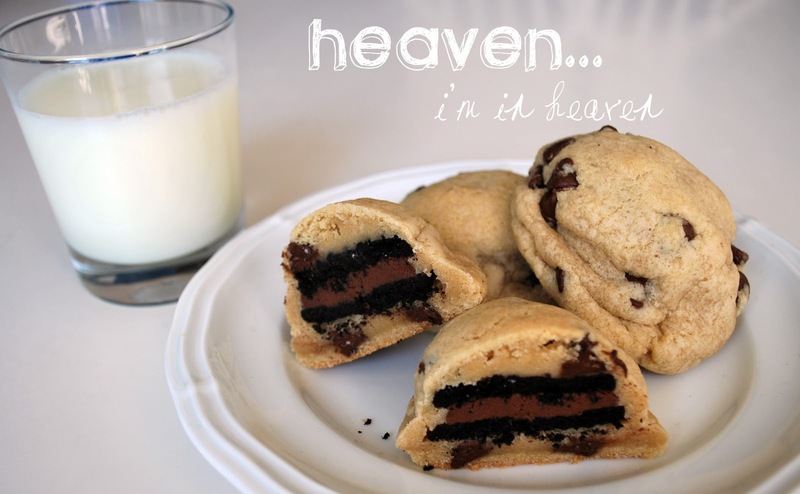 Those look like heaven but there is no way I am making those right now. I finally got my bum back in a size that doesn't make me cringe!!!!! I guess I just need company to come so I can make those!! what???? you might be a superhero. i'm looking into it. that last one was tara by the way. that darn andy! Now I know what we're having for our FHE treat tomorrow!